The first volume of the Coldfire Trilogy, Black Sun Rising is a book which I originally read in high school. I was captivated by the cover art by Michael Whelan (I very clearly remember seeing the slightly beat up hardcover copy at the local public library and knowing that I just had to read it). Rereading, I see that BSR has had a far larger impact on my gaming taste than I had previously thought. The plot is not the strongest and the characterization is only okay, but where this novel shines is the setting, which seems almost tailored for a D&D type game, and in a way that does not seem contrived. Just for one example, in traditional mythology vampires fear running water. That just falls naturally out of the setting, along with many other such features. If you don’t like overly systematized fantasy, the Coldfire Trilogy might not be for you, but I would suggest that systematized settings are exactly what are needed for a fantasy game. But enough about generalizations; what makes the setting special? The setting is hard science fantasy in the sense that the world is expected to conform to the laws of physics and is explicitly set in the far future; the characters are the descendants of Earth colonists on an alien planet. The “magic” is a property of the planet Erna which exudes an energy called “fae” naturally. The fae comes in several different variaties, the most common of which is called earth fae, which humans can “Work” in order to create magic-like effects. Additionally, there is tidal fae (protean, unpredictable, lunar, unworkable by humans), dark fae (which waxes in the absence of light), and solar fae (which is not explained in much detail but is associated with sunlight somehow). The earth fae is connected to geological dynamics, and flows strongest in fault lines between tectonic plates. Sorcerers that try to work the fae when an earthquake hits get their mind fried (and Erna is very geologically active, so this is a real and continuous danger). The fae has inspired a number of my recent chaos magic posts (the parallels between manipulating chaos and working the fae should be clear, though I would hope to present chaos more mythologically). There are two main protagonists, Damien Vryce and Gerald Tarrant, who end up working together despite being polar opposites (the contrast is obviously supposed to be the primary thematic tension of the series; the idealism of Damien the priest and the ruthless pragmatism of Tarrant the sorcerer). Damien is probably the most cleric-like character in any fiction I have read (perhaps to an even greater degree than characters in TSR setting fiction, surprisingly). He’s a tough priest that belongs to an order of church demon hunters that believes in working the fae despite the fact that church doctrine opposes sorcery. Damien partly inspired my recent church sorcerers post. The fae is not just power though; is is psychologically reactive. The fae gives flesh to the things that people fear, and such faeborn creatures feed on human emotions. Thus, the planet Erna creates the monsters of human myth. Such monsters are most powerful at night, and are mostly unable to threaten people during the day. They are also weakened by deep or flowing water (alluded to above) as that acts as a buffer around the earth fae. Friedman describes how fae-wraiths cluster around the walls of small settlements at night, trying to get in but being repelled by wards designed to keep them out. 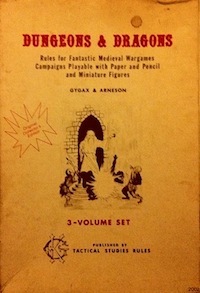 It’s perfect for D&D, and something that I have been using for as long as I can remember myself, though I may have originally gotten the inspiration from reading this series way back when. Despite the rationalization and explanation of the magic system, the actual effects which characters generate with the fae are mostly rather subtle. There are few fireballs or magic missiles being hurled around (though Tarrant does engage in some rather dramatic coldfire displays in some parts; he is somewhat special though, for reasons that I don’t want to discuss here lest I spoil the plot). Instead, most fae workings are concerned with information, and are essentially “Seeing” the fae (being able to get information is also controlled by the direction of the flow; if someone is “upstream” from you, more information is available). There are also Healings, Wardings, Banishings, and many other kinds of working. Additionally, some people, called adepts, are born with fae-sight. Essentially, natural born sorcerers, whereas most people must learn how to see and manipulate the fae in a more academic manner (a virtually perfect mapping to the wizard/sorcerer dichotomy in D&D). I feel like I could go on and on about how many of the setting elements harmonize so perfectly with the assumptions of D&D. The monotheist-style church trying to bring law through faith to the chaotic wilderness, struggling against fae-born godlings which also have their own “pagan” worshippers. But the power of the planetary fae gives these things real corporeal power. It ends up feeling a bit like a less solipsistic version of the World of Darkness Mage setting, where the nature of reality is determined by what people believe. Complicated technology (like guns) are less reliable because people do not completely understand the mechanism and fear that it will not work (and this fear is made into real danger by the fae). Once the original colonists had landed on Erna, they were stranded because their own psychology prevented their advanced technology from working reliably. It’s such a wonderful justification for a world full of adventure and danger. This entry was posted in Uncategorized on October 5, 2012 by Necropraxis. I’ve got this trilogy, but have been saving it for a rainy day. I was thinking just a couple of days ago, that it might be time to go ahead and read it. It’s pretty good for a general fantasy lover, but fantastic for a D&D player. Give it a shot! Nice article, full of great inspirations. BTW, C.S. Friedman is a roleplayer. She was a member of the Camarilla (the old WoD fan club) back in the late ’90s, when I was also a member. Ok I just finished this book. It had its hard points as I had little desire to care about any character, except Terrant, and the device which set them on their course seemed a stretch. But I don’t understand who did what with the cold fire and Senzei… It was never explained or I missed if. It wrapped up nice though and I’m gonna keep reading.